Fallen Leaf Lake is one of the beautiful alpine lakes near Lake Tahoe. It offers spectacular views of the lake and surrounding mountains that often reflect off the surface of the water creating a breathtaking back drop. The homes surrounding Fallen Leaf Lake range from small cozy cabins to large intricate estates—all of which have been designed in a custom fashion with a high degree of creative craftsmanship. Fallen Leaf Lake lies directly beneath Mt. Tallac—one of the Lake Tahoe Basins highest peaks, which results in fantastic mountainous views from anywhere in the Fallen Leaf neighborhood. Fallen Leaf Lake is boater friendly—making for a great way to enjoy a pull on a wakeboard or waterski, a morning out fishing, or just a gorgeous and serene boat ride. There is a marina and general store at the back of the lake. 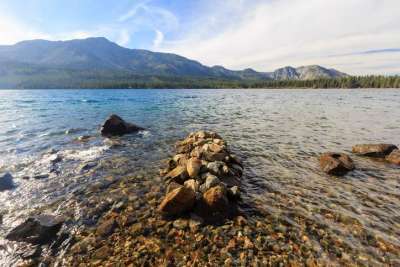 The Fallen Leaf area is far enough away from South Lake Tahoe to offer an extended version of peaceful serenity; however, it is still close enough to enjoy the many activities that make Lake Tahoe so notorious worldwide.